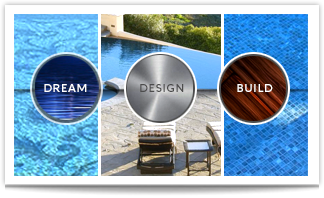 Modern Watershapes began in the pool service industry and continues to specialize in high end residential water feature maintenance including pools, spas, fountains and a variety of other water features. We service the following areas in the South Bay: Palos Verdes, Manhattan Beach, Redondo Beach, Hermosa Beach, Torrance, Long Beach, El Segundo and Rolling Hills. We use quality testing and cleaning equipment, arrive on time each visit in a professional uniform, and treat your backyard as if it were our own. Education is key in this industry, and not only are our technicians constantly being trained on the newest technology and methodology in the pool industry but we bring that to the home owner. O ur maintenance program is for weekly services including chemical testing, the removal of all debris, cleaning the tile and checking the equipment for proper operation. Each weekly visit a service log is recorded for our records and yours which provides the client with a time stamped, emailed log each week documenting our services and leaving information pertinent to the customer in the log. Many of our clients use our services on vacation homes or are never home during our service visit so this keeps us in touch even when your busy lives don’t make it easy for you to communicate necessary information to us. Service rates are based on size and location of the pool, what type of equipment the system runs on, ease of access to the site, and many other factors so a FREE ON-SITE INSPECTION is required for appropriate service estimates. All regularly added chemicals, cleaning, and testing equipment is included in the monthly service rate. 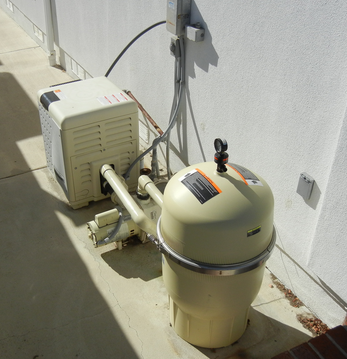 Extra charges include: filter cleaning, salt cell cleaning, ORP probe maintenance and inspection, cyanuric acid (conditioner), pool salt, and a few other items based on your individual watershape conditions. 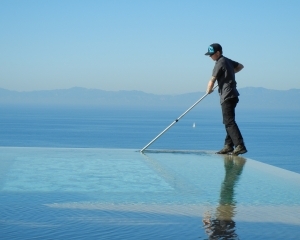 Modern Watershapes offers chlorine washes, acid washes, pool sanding and other techniques used to revitalize neglected pools and older surfaces. 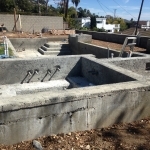 These procedures are not for every finish or pool, so a site inspection is required before moving forward with them. Acid washing can often remove years of scale, salt deposits and neglect on plaster surfaces and bring them back to the quality of their original finish if not extremely close. 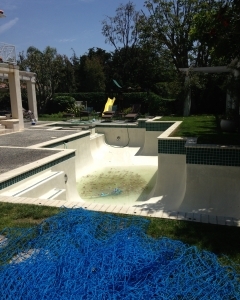 Chlorine washes can help eliminate persistent algae issues and extreme algae infestations. Please contact us for pricing and availability. Our company takes pride in offering preventive maintenance wherever possible. Most major distributors and manufactures of gas fired pool and spa heating equipment highly recommend routine annual inspection and cleaning in order to provide a longer lifespan of this equipment as well as making sure they are safe from fire hazards and other issues. Jandy HI-E heaters are required to have annual services completed to prevent corrosion from the condensation systems within. 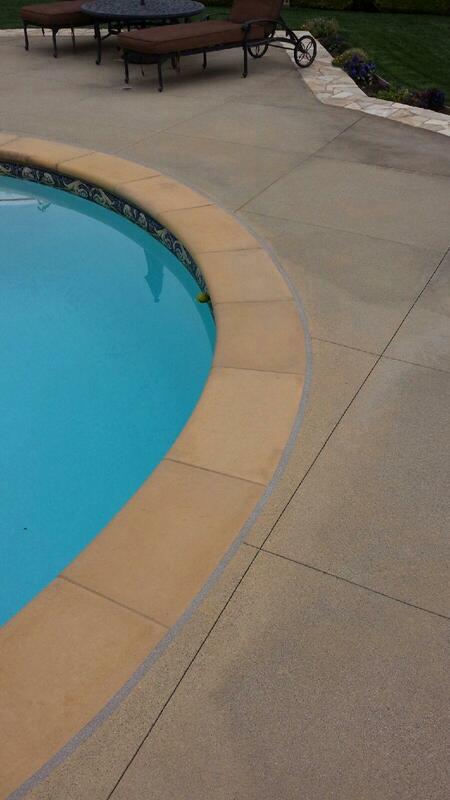 A proper mastic seal around the pool deck between the coping and deck is essential for preventing water from getting between the shell of the pool and the deck. Typically these “seals” are done with a “deck o’ seal” self-leveling product that we have found is not near the quality level of other providers. 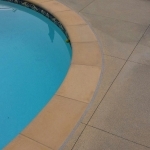 Our professional installation team will remove, grind and clean the existing joints removing all traces of the previously failing seal, and install a hand-troweled, sanded mastic finish that will protect your watershape and the deck around it from water building up inside the gap between the pool and deck. Please contact us for pricing and availability. 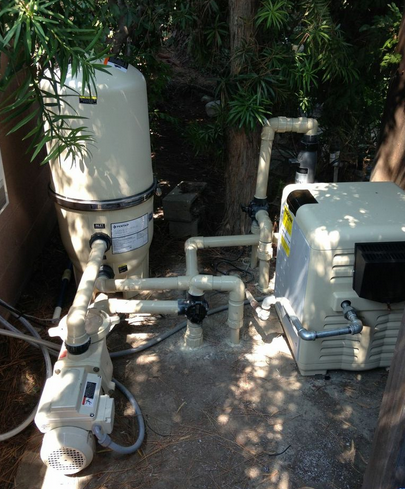 Modern Watershapes has a professional installation and repair team ready to handle any issues in your backyard. We specialize in working on Pentair, Jandy, Hayward, Raypak, IPS Controls and many other commonly used systems. 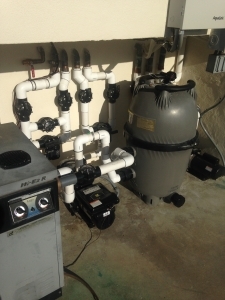 Most of our clients utilize automation, variable speed technology, IPS control and PH monitoring, salt-system chlorine production, and wireless technology to control their pools and trust only us to maintain, replace, and keep their equipment in check. We also offer entire system upgrades and replacement, whether it be complex multi-pump systems or simple one-pump systems. 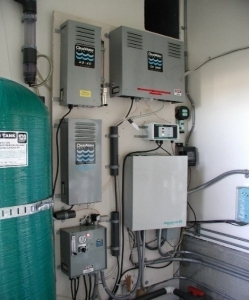 Modern Watershapes believes in doing anything we can to help our customers utilize energy efficient equipment to not only put more money in their pockets but avoid wasted energy and water loss in improper equipment installation, over-sized pumps and filters, and many other common situations. We have installed over 200 variable speed pumps within the last 2 years alone and our clients could not be happier with the reduced noise and energy levels of these systems. We believe in using automation and variable speed technology to properly control the movement of water through the system to provide proper filtration as the lowest possible RPMs to save on electricity. Many home owners are concerned about over chlorination or chlorine in general as an irritant and “poisonous” solution to sanitizing bathing water. Despite the numerous systems out their designed to be “chlorine free,” the truth is the water you drink every day whether from tap water or a plastic bottle contains low levels of chlorine. The key to perfect water conditions is properly balanced ph, alkalinity, and low levels of chlorine maintained at all times. Salt-Systems and typical chlorine delivery systems (tabs and chlorine pumps) do not accurately and routinely check the chemistry of the pool. Chlorine “free” systems only work in a test-tube environment or pools that have extremely low or no bather load and require perfect conditions at all times to work and sanitize the pool properly. Simply coming once per week or even twice per week to a watershape is not going to provide enough accuracy and measurement of the chemistry to provide perfect bathing water at all times. Our solutions include chemical testing systems built directly into your existing equipment that constantly monitor the ph and chlorine levels and only deliver the amount necessary to sanitize the water. The days of throwing gallons of chlorine into a pool are behind the industry, and if our clients are interested in taking the next step to swimming in perfectly balanced water, we are here to deliver and educate. Call us at 310.339.8192 to schedule your complimentary on-site inspection. Copyright 2019 Modern Watershapes. All rights reserved.